In the wake of the completion of the $111.9 million Bing Concert Hall in January, Stanford University has kicked off construction on a new seven-story hospital as part of the ongoing renewal of its medical center. Designed by New York City–based Rafael Viñoly Architects, the facility features a modular layout that allows for incremental horizontal extensions to the building. This development strategy seamlessly merges with the low-rise campus. 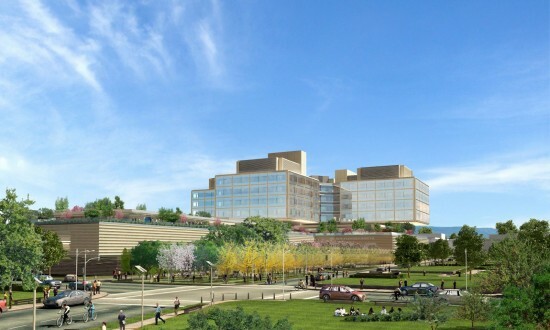 “This project represents an unprecedented endeavor in the hospital’s successful 50-year history of healing humanity,” said the ever-modest Viñoly in a statement. “By reinterpreting and updating the Stanford campus and the original hospital through a modular plan, it is poised to adapt to evolving medical technology while continuing to provide advanced care and treatment—in a healing environment unique to Stanford—to patients from surrounding communities and beyond.” One of the largest developments currently underway on the San Francisco Peninsula, the new hospital will be open for patient care by 2018. The design is based around a universal modular building block measuring 120 feet by 120 feet, which was calculated to offer the best possible arrangement for numerous hospital roles, guaranteeing flexibility in adjusting to the constantly shifting needs of medical technology. The new building includes 368 private patient rooms with wall-to-wall windows that provide natural light and sweeping views, high-tech diagnostic and treatment rooms, and a Level 1 Trauma Center that triples the size of the existing Emergency Department. A 1,000-car parking structure and five gardens are part of the modular plan, which integrates open public spaces such as a glass-covered atrium and landscaped drop-off plaza. The hospital will be seismically isolated to protect occupants and the facility from catastrophic earthquakes.